3M Cavilon Antifungal Cream is an antifungal barrier cream that contains 2% Miconazole Nitrate. Miconazole Nitrate is proven clinically effective in the treatment of tinea pedis (athlete’s foot), tinea cruris (jock itch), and tinea corporis (ring worm). The barrier protects against moisture and the easy-to-spread formula soothes affected areas. 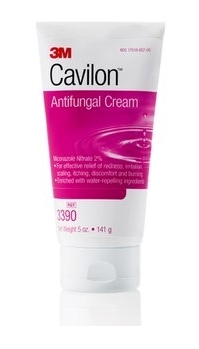 Cavilon Antifungal Cream is enriched with water-repelling ingredients and is latex free. Use for effective relief of redness, irritation, scaling, itching, discomfort, and burning. It is for the treatment of superficial skin infections caused by yeast (candida albicans).